Salespeople, it seems, are pre-programmed from birth to always be seeking approval. We strive to get to Yes, not just because it can mean a commission check, but also because of our deep-seated need for an “attaboy.” At least that is what all of those management seminars try to tell us. You’ve probably been to them; they carve up the working world into a four groups, with salespeople ending up in the top righthand quadrant. This is the space for not only salespeople, but also for entertainers, evangelists, and other overly talkative people. CEOs are usually in the top left quadrant, along with others who believe in no-nonsense, straightforward methodologies. Other examples for this group include sports coaches, generals and admirals, and Machiavelli. The bottom right typically is for those who think (and think and think and think) and include engineers, scientists and other ponderers. The final quadrant is reserved for the bane of all salespeople: those in charge of making things the salesperson promised actually work. This group is full of project managers, estimators, and administrative people. There is quite a bit of science that has gone into these types of categorizations. Some are quite complex, such as one that classifies people into 13 different groups with 3 modifiers. On several occasions I have worked directly with one firm, Personalysis, who teach a standard quadrant analysis but takes it to a higher level by teaching how to be more successful interacting with the different types of people you will encounter. How each of these groups address good news, bad news, and ambiguous news is important when working with a client, but for now lets just try to understand how the different answers you get during your questioning process affect you. Good news is good news. Simple enough. It is easy for the client to give us a Yes and it is easy for us to feel good about it. Examples are that the budget is established, our product or service can be offered in a way to meet the budget, and we have a great relationship with the client. We tend to push all good news to the front of the line and give it ample weight. But as we’ll see below, Yes is not always good news. Bad news is also good news. That’s right. Bad news is good news because it is definite, and a defined No means we have reached an understanding on a topic of discussion. Bad news may not be good news, but it is always better than vague news. Why is this? Bad news is usually more accurate than good news. For example, if you were to ask your prospect if the project has a budget and he gives you a Yes, that may not be 100% true. There may be a committee that is talking about the budget, or maybe he is digging around for enough information from you to put together a rough budget for next year. So a Yes may not really be a firm Yes – it might just be a Qualified Yes. A Yes can be (and often is) fudged. But if the answer to the budget’s existence is No, that is usually a very Definite No. “No” is the most truthful thing your client can tell you. In this example, your prospect has revealed the most critical part of the sales process…there is no budget! 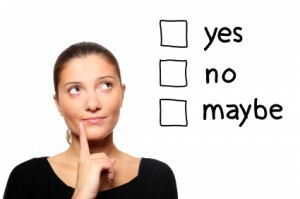 Better yet, because this is an easy Yes/No answer and the answer was No early on in the sales process, you have discovered that no matter how many presentations, how amazing our proposal, or how tight your relationship is, you may be spinning your wheels on someone who at best is twelve months away from a purchasing decision. A No is good because it keeps you in the qualifying process, helping you decide how much time you should spend with your prospect. When a prospect says No, it does not mean that the sale is dead and you should move on. In fact, during any large, complex, or technical sale, you will be told No many times throughout the engagement. Usually, No just means there are more questions to ask, more people to meet, and a joint strategy session with your prospect to look at the project more realistically and find out if there is a qualified pathway that would allow you and your prospect to move forward. The title of this chapter is Yes Is Good, No Is Good, But Maybe Will Kill You. In Chapter 12, we dive into the shark-invested waters of Maybe. Chapter 10: Are You Afraid To Ask About Their Budget?